NAS (“Network Attached Storage”) is all about keeping your data safe and secure, no matter where you go or what devices you use. NAS is attached to the network at your home or office, which allows multiple network users to store data in one safe place. In the world of PC technology, NAS doesn’t get a whole lot of attention. However, NAS is something that becomes a big deal when you need it; therefore, it’s important to familiarize yourself with NAS features and specifications so that you can purchase the best NAS with confidence. Why get a NAS when you can just use an external hard drive to store your data? A NAS connects to a network, not a computer; this means that you have much more options for what you can do with the stored data. If something happens to your computer, you might lose that data forever. With NAS, your data is still safe within the connected network. Additionally, you can also use NAS to stream content, such as music and videos, anywhere you go. Understanding NAS units and their specifications can be a challenge. If you’re thinking about getting the best NAS for your needs, it’s important to research how to setup your NAS in the way that works best for you. A NAS holds hard drives within it. These hard drives can have different storage capacities. Documents: Word documents typically don’t take up much space, so if you may not need to spend more on a larger capacity NAS if you’re just storing these types of files, such as in an office. 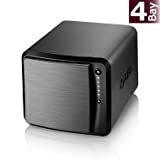 Media (music, movies and images): If you’re an avid media user, editor or photographer, you’re going to need lots of space to store those files. The higher quality media you use (such as HD videos), the more storage you’ll need. This is especially true if you live or work in a place where multiple users are accessing and sharing very large data files. Do you use RAID? RAID (“Redundant Array of Inexpensive Disks”) is something that you enable in a system, such as a NAS unit, that provides fault tolerance and performance optimization. Essentially, RAID provides added protection for your data and helps your NAS run as best as it can. If you use RAID, it will take up more space within the NAS, so keep this in mind when looking at capacity. Some NAS come with hard drive disks, while others do not. The Pros of No Disks: You have the freedom to add your own hard drives based on the size and brand that you prefer. The Cons of No Disks: You’ll need to buy extra hard drives and spend more time setting the NAS up. The Pros of Disks: A NAS with preinstalled disks is convenient because those disks are already configured for that NAS drive. You can set up your NAS quickly and easily (in comparison to diskless). The Cons of Disks: The disk that the NAS comes with may not be best quality based on your needs for space and features. NAS connects through the network at your home or office via a Wi-Fi network or your router. Most NAS units typically connect using a Gigabit Ethernet cable. In order to get the most out of your NAS, it’s important to have a high-quality router and a strong internet connection. Whether you own your own business or live in a household with various devices, you might come into a situation where multiple users need to access a large chunk of data. That’s exactly what a NAS does; it makes it so that everybody can store and access data through the NAS server, without worrying about losing or misplacing files. NAS can give you remote access so that you can view and manage your files wherever you are on whichever device you choose. This can be achieved by making an account with the NAS manufacturer and using your login to access your files. As previously mentioned, RAID means “Redundant Array of Inexpensive Disks” and it’s designed to provide a safety net for the data on your NAS unit. There are different types of RAIDS. The type of RAID you need will depend on the drive capacity of your NAS unit. Hard drives can break down, and that is why NAS has fault tolerance so that you can save your data even if you lose a hard drive. For more tips on NAS security, check out this guide. QNAP TS-451+ comes with a 64-bit Intel Celeron Quad-Core 2.0GHz processor and 2GB DDR3L RAM which can be boosted up to 8GB. Note that it can also increase the processor’s clock rate up to 2.4GHz what is especially great for CPU-intensive tasks. This NAS has dual gigabit LAN ports and can reach up to 225MB/s of read as well as write speed. This QNAP NAS is provided with AES 256-bit volume and folder encryption, and its transfer speed reaches up to 205MB/s. It has also got a user-friendly interface which guarantees easy file access. 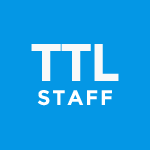 By the way, its File Station presupposes convenient file management solution which covers remote mounts, mobile apps and public cloud services. It supports Google Chromecast, Amazon Firestick, Roku, AppleTV and lots of others. Thanks to HDMI connectivity QNAP TS-451+ allows you to get connected directly to an HDTV as well. What is more, this NAS has a Plex app. Here’s another great NAS to keep your data safe and secure. Drobo 5N2 is an updated version of Drobo 5-Bay NAS. It provides high speed for data sharing and remote access. This NAS is quite simple to use and includes automatic protection against hard drive failures. The 5N2 is a great option for those who have Mac devices as it offers integration with Apple Time Machine. There is also Adaptive Link Bonding used for link failover and link aggregation without Ethernet switch support. It also provides myDrobo Platform support as well as encrypted-end-to-end remote access. Thanks to DroboPix all uploads of mobile files are also protected. By the way, Drobo 5N2 comes with DroboApps support which covers WordPress, Plex, ElephantDrive, Resilio Sync, etc. This NAS is designed with two built-in M.2 NVMe SSD slots for system cache support. In addition, there are dual 1GbE (RJ-45) ports with failover and Link Aggregation support. Synology 5 Bay NAS DiskStation DS1019+ delivers fast performance with decent reading and writing speed for encrypted data which reaches up to 225MB/s. Note that it comes with quad-core CPU and AES-NI encryption engine. The DS1019+ has two 4GB DDR3L memory modules, which means 8GB of general memory capacity. This Synology NAS is also rather multifunctional as it offers different applications not only to share files but also to backup data. What is more, there is an option of dual-channel H.264/H.265 4K video transcoding on the fly. 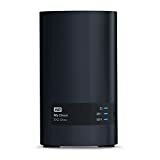 You can use this Disk Station to stream TV shows, movies and songs to your PC, smartphone, Apple TV or any other device. Besides, its Surveillance Station provides additional protection for your data offering network cameras, which can be managed from almost any spot of the world just with the help of a simple mobile app. 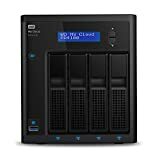 My Cloud Pro Series is also a great choice in case you need centralized storage to keep all your data organized and safe. This WD Diskless NAS is designed with Intel Pentium N3710 Quad-Core 1.6GHz Processor and 4GB of RAM. There are also multiple RAID options to protect your data as well as password protection and 256-bit AES volume encryption. It can be used to stream almost any type of content including HD videos due to its high speed. What is more, there is built-in hardware transcoding which allows you to stream media in the right format. My Cloud Pro Series has also got installed Plex Media Server, so you can stream to any device. Note that the latter one comes with 3-month trial only. WD Diskless PR4100 is simple to setup and to use as it comes with tool-less and tray-less drive bays. There is also My Cloud mobile app for easy file management and control, and access to the Adobe Creative Cloud for file editing. If you need NAS which supports hot-swappable drives then consider ASUSTOR AS6204T. It has got Intel Quad-Core 1.6GHz processor which can be also boosted up to 2.24GHz. There is 2GB LAN supports failover and Link Aggregation. Besides, there is an HDMI port. 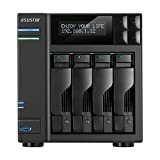 ASUSTOR AS6204T comes with solid construction what makes it a durable NAS. What is more, it delivers quiet performance. Setup process isn’t tricky and time-consuming as well. Its Control Center portal comes with a File Explorer, Activity Monitor, External Devices Manager and Internal Devices Manager, which can be used with mobile apps or via the web. Need a budget NAS? Then Synology 2 bay NAS DiskStation DS218+ is one of the best options to choose from in case you aren’t going to spend a fortune. Still, despite its affordable price Synology DS218+ delivers decent performance with a reliable security level. It comes with 2GB of RAM which can be expanded up to 6GB. There is a dual-core processor with AES-NI hardware encryption engine. The DS218+ is a great choice for small business as it is designed with the integrated Btrfs file system to provide advanced storage technology. Another great budget NAS is NETGEAR ReadyNAS RN422. It has two bays which support up to 20TB of storage. Optional EDA500 expansion chassis provides up to 70TB. The RN422 is designed with dual-core Intel C-3338 Atom server processor and 2GB of RAM. This NETGEAR unit has 5 levels of data protection including X-RAID, Unlimited Snapshots, Bit rot protection, anti-virus and offsite replication. By the way, despite its low price, this NAS has 2GB Ethernet ports which come with link aggregation support for 2X the throughput and fail-over protection. ReadyNAS RN422 is easy to install and to use thanks to its tool-less drive trays. There is also intuitive monitoring and remote management. NAS TS-453Be-2G-US is another great QNAP model. It is designed with Intel Celeron J3455 quad-core 1.5GHz processor which can be boosted up to 2.3GHz. Its 4GB DDR3L RAM can be also expanded up to 8GB. This NAS has AES-NI encryption and supports 4K hardware transcoding as well as 4K media playback. There is dual 4K HDMI port and its PCIe port supports installing a 10GbE network card. So, you can use this NAS for multimedia viewing on HDTV via HDMI output as well. What is more, there is USB 3.1 port. 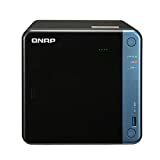 QNAP TS-453Be-2G-US comes with snapshots to take a picture of your storage. It means that you will be able to roll back to the exact time of ransomware attack or accidental deletion. By the way, you can easily boost its performance. To do this you need to use full Potential of your PCIe slot with M.2 SSDs and Qtier. 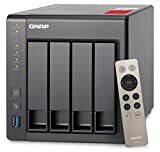 This QNAP NAS is also highly compatible and supports Google Chromecast, Amazon Firestick, Roku, AppleTV, DLNA, etc. WD My Cloud EX2 Ultra is one of the most reliable and secure NAS you can find for such an affordable price. It offers centralized network storage and allows access using a PC or a smartphone. Its 1.3GHz dual-core processor comes with 1GB memory. Sure, it’s not the best speed you have come across but it’s quite enough for decent performance. The EX2 Ultra is provided with Milestone Arcus Surveillance software which has unlimited camera licenses as well as numerous RAID options. For example, you can use RAID 1 for mirrored data protection or RAID or to boost overall NAS performance. All RAID options let you customize NAS according to your needs. Zyxel NAS540 is a budget NAS with screwless design, which provides quick and simple drive installation. Besides, it delivers quiet performance thanks to its 120mm silent fan, which also takes care of NAS ventilation. There is 1.2 GHz dual-core CPU and 1GB of DDR3 RAM. Its 3.0 ports provide data transfer rates with up to 4GB/s speed. Its SD slot comes with the latest SDXC support and lets you transfer files to NAS540 for easy and fast backup. By the way, this Zyxel NAS offers a range of RAID options what guarantees reliable protection in case of hard disk failures. Thanks to user-friendly GUI there is also an intuitive graphic interface which makes apps management an easy process. What is more, you can use Web GUI to control network storage health status including fan speed and CPU utilization. If you’re someone who creates, uses and manages large amounts of data using a computer, laptop or tablet, you might need a NAS. If you’ve been hunting for the best SSD for gaming and the best external hard drive options you might also be interested in finding the best NAS so you can be sure that all your games and multimedia files are safe and accessible. With the best NAS, you can ensure long-term protection of your important data and personal files. NAS leads to security, and security leads to peace of mind! Why You May Need NAS?